The urban doughnut, in planning parlance, has inverted. The once dense, decaying city surrounded by wealthy tree-lined suburbs is still thick with residents and tourists (perhaps more so than ever) but has given way to peripheral pockets of poverty with increasing income and racial diversity, encircling prosperous urban centers experiencing record low crime, concentrations of high-skilled high-income earners and rapid development. This new wave of gentrification, scholars suggest, could be motivated by a desire for shorter commute times or high-end amenities. Mayors and governors charged with balancing budgets and generating a tax base cannot ignore the benefits of revitalized business districts and a growing investment class. Lower Manhattan is now a collection of major chains like the Gap replete with ostentatious architecture not befitting the neighborhood’s character. Here and throughout the text, long-time businesses pay the price for the city’s progress. The famed Second Avenue Deli for example, was ordered to close after 52 years after a substantial increase in rent—a recurring theme throughout the book. Modern gentrification in New York started in the 1970s and was initially sporadic and somewhat isolated. But today, the city is experiencing hyper-gentrification originating in the post 70s fiscal austerity that jolted city and state leaders into luring developers, tourists, and high-skilled high-income professionals that supported a stronger tax base. After four waves of progressively pervasive changes in neighborhoods across the five boroughs, the “aggressive” and “frenetic” pace of development into the 2000s leads Moss to conclude that hyper-gentrification has firmly taken hold. Before delving too deeply into his discussion, Moss provides a brief history of discriminatory policies dating back to the 1930s that kept populations segregated, unequal, and devoid of substantial financial investment. Robert Moses, the urban planner who had “deep disdain for common people” added physical decimation to already economically troubled neighborhoods, reshaping New York City profoundly and permanently. He plowed through homes and neighborhoods to build expressways, parks and cultural institutions targeted to wealthier residents and visitors. Urban unrest, crime and fiscal woes prompted white flight that paralleled nationalized white backlash to the Civil Rights Act fanned by George Wallace’s manipulation of white working-class Americans against immigrants and urban centers. White ethnics in New York may have commiserated with these voters across the country but soon found themselves to be victimized and displaced by urban renewal schemes back home. In the 1990s, Giuliani’s quality of life strategies and draconian zero-tolerance policing drove New York City’s residents apart. Post-September 11th rebuilding and rebranding unsettled and already fractured city that Bloomberg, as the author suggests, marshaled with disastrous effect. 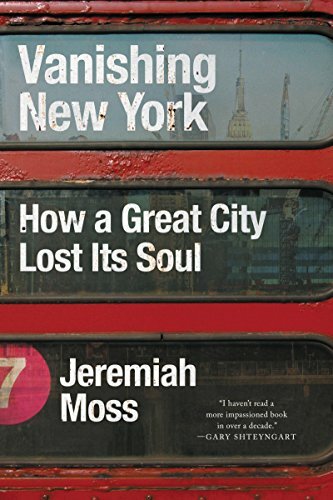 Few will truly understand how the narratives in Vanishing New York cut to the core of how New Yorkers live and interact, though the theme likely resonates in cities big and small across the country. Moss leaves us with twelve recommendations for activists. Among them, he wants to empower community boards—grassroots neighborhood-based governmental units—by awarding local residents decision-making ability over development, control of the spread of chain businesses, protection of small businesses, expansion of landmarking, and imposition of a vacancy tax on landlords who create high-rent blight. We often forget that the good ol’ days were pretty bad in many ways. But the book does a good job of highlighting a global Enron-styled return to the Gilded Age that thrives on excess. For politicos, the subtext reveals a requiem for the loss of liberalism. In a city with a 6-1 Democratic-to-Republican registration, voters chose 20 years of non-Democratic mayors in Giuliani and Bloomberg. But Vanishing New York isn’t looking for a liberal hero so much as it just wants its city back—complete with all its wrinkles and warts. Basil Smikle, Jr. is executive director of the New York State Democratic Party. He is also President of the consultancy, Basil Smikle Associates. A frequent commentator on both local and national media, he holds adjunct appointments at Columbia University’s School of International and Public Affairs and the City University of New York’s School of Professional Studies.